War Department General Order 245, Dec. 13, 1909, named Fort Drum in honor of General Richard C. Drum, "who served with distinction during the Mexican War and the Civil War and who died October 15, 1909." 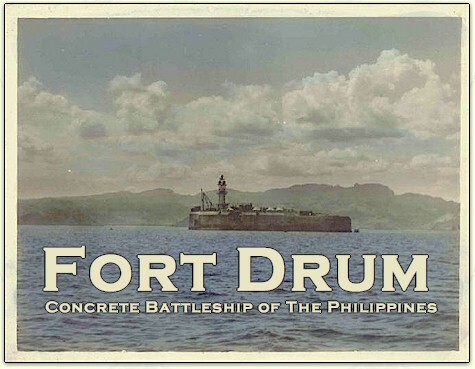 Fort Drum was located on El Fraile Island, about 7500 yards south of Caballo Island and by virtue of its peculiar character, a static battleship in the southern approaches to Manila Bay, it was the most unique of the Harbor Defense forts. The island itself had been levelled and a reinforced concrete battleship-shaped structure measuring 350 feet long by 144 feet wide had been built upon it. The top deck of the 'battleship' was 40 feet above the mean low water and 20 feet thick, and housed 4 casemated 6in guns and a 60ft fire control cage mast. Its exterior walls ranged between approximately 25 feet and 36 feet thick, making it virtually impregnable to enemy naval attack. Also unique to the defensive forts of the Philippines was that Ft. Drum was equipped with guns in armored turrets. The concept that forts could be attacked from the air would not be recognized for decades yet, and the coastal defense forts of Manila Bay, notably Corregidor, being entirely open to the skies, would suffer extensively from the air in later decades. "The Armament of Corregidor Island is completed and mounted with the exception of four mortars which are now under manufacture and will be shipped this fall. On Carabao Island the emplacements for the 14 inch batteries and mortar batters are practically completed. 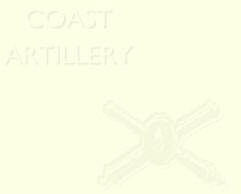 The guns and carriages will be shipped in the fall (1912) and mounted probably before the close of the fiscal year (June 30, 1913). With the installation of this armament the strength of the defenses of Manila Bay will be greatly increased. The fire control and search light installations for Carabao have proceeded simultaneous with the battery construction, and the mounting of the guns will complete the defense at that point. On Caballo Island (Fort Hughes) the emplacements have been started, and the armament for the batteries are under construction. It is believed that the last obstacle to the success of the project for the fortification of El Fraile Island (Fort Drum) has been met by the latest plan of construction." "Fortification construction continues at the entrance to Manila Bay and has progressed to include the completion of Fort Frank, Carabao Island; that at El Fraile and Caballo Islands is making good progress." In early 1911 the blessing and curse of modern communication technology had reached Fort Drum. That year a 1/8 kilowatt radio was installed at Fort Drum as well as on Carabao Island, Fort Wint and Fort Mills. It was only a small low-power station, and it was discontinued by 1914 because, as Brigadier General G. P. Scriven, Chief Signal Officer of the Army explained, its use was no longer being necessary following the laying of submarine cables between the points.